To make croutons, tear bread into bite sized pieces and place on lined tray, Drizzle with olive oil, salt and pepper. Bake for 10mins or until golden brown, set aside to cool. Heat fry pan over medium heat with oil and add chicken breast and cook for 2mins on each side, season with salt n pepper. Place chicken on lined tray and bake 15-20min until chicken is cooked through. In same fry pan over medium heat, add bacon pieces and cook until golden and crisp, remove bacon and place onto paper towel to drain. 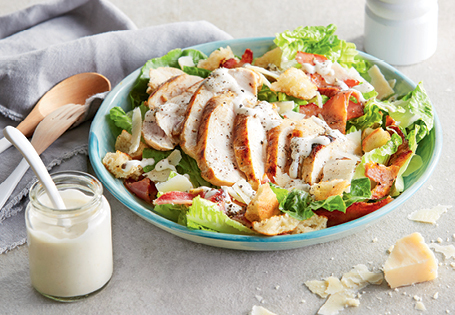 To assemble salad, toss lettuce in large bowl with enough dressing to just coat the lettuce. Add bacon, parmigiano, croutons and toss. Serve in 4 bowls with sliced chicken on top. Drizzle a small amount of salad dressing over chicken to serve.